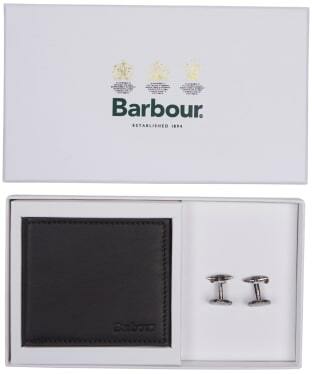 Perfect as a treat for yourself or a loved one, the Men's Barbour Leather Wallet and Cufflinks Giftset is sure to be a great choice for any stylish gentleman. This indulgent gift set comprises a real-leather wallet designed with a slim profile and multiple card slots, and aged-effect brass stud cufflinks with Barbour logo detailing. A branded box makes for effortless gifting. 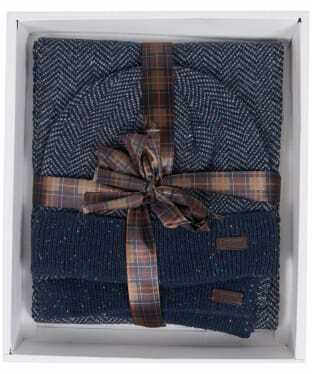 The Men's Barbour Herringbone Knitted Hat and Scarf Giftset is the perfect choice for any gentleman who wants to battle the cold whilst continuing to look their stylish best. This hat and scarf combination have been crafted from a wool blend for a cosy and insulating feel and have been designed in a stylish herringbone design with flaked yarn and include the Barbour logo embossed onto a leather badge for that final stamp of style and quality. Both neatly presented in a Barbour branded gift box, this is the perfect present for a loved one or simply a treat for yourself. 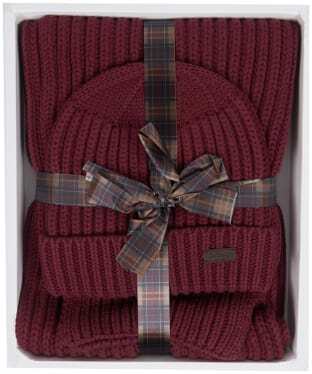 A gift that he is sure to love, the Men's Barbour Donegal Knitted Giftset features a matching hat and scarf set crafted from a super soft and warm wool mix. Perfect for pairing with his favourite Barbour jacket, this giftset will definitely come in handy during the colder months, whether he is heading out for a country stroll or simply popping into town. 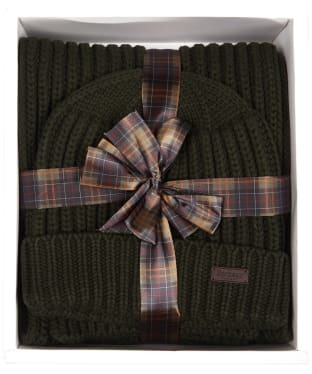 Finished with signature Barbour branding for that added mark of quality and style, this hat and scarf are packaged in a Giftbox making it a great treat for yourself or a loved one. 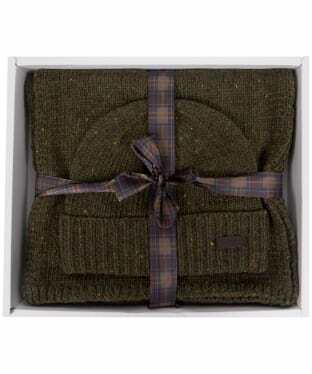 The Men's Barbour Chunky Rib Knitted Giftset is the ideal choice for any stylish gentleman. Whether you are treating yourself or a loved one, this set is perfect for the cold weather, featuring a hat and a scarf designed to a chunky rib knitted style, sure to keep you on-trend throughout the chilly seasons and beyond. 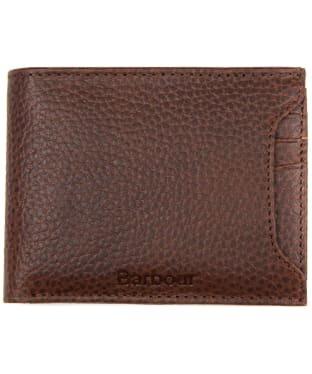 Designed with style and practicality in mind, the Men's Barbour Combination Giftset offers a billfold wallet that features a separate section that can be used to conveniently store your identification or travel card. Crafted from 100% leather for that added touch of premium styling, this wallet has ample space for all of your monetary essentials. Finished with signature Barbour branding for that mark of quality, this wallet is the perfect accessory for any gentleman. 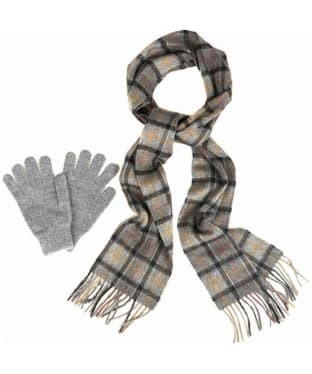 Treat yourself or a loved one with the Men's Barbour Scarf and Glove Gift Box which features a Barbour tartan scarf and gloves, both crafted from lambswool for that premium feel and exceptional warmth, perfect for the cooler seasons! With a fringed hem to the scarf for that added touch of winter styling, this gift is sure to be gratefully received by any stylish gentleman.